ment, Jordan University of Science and Technology, Irbid, Jordan. 0.0027 it is $0.402. 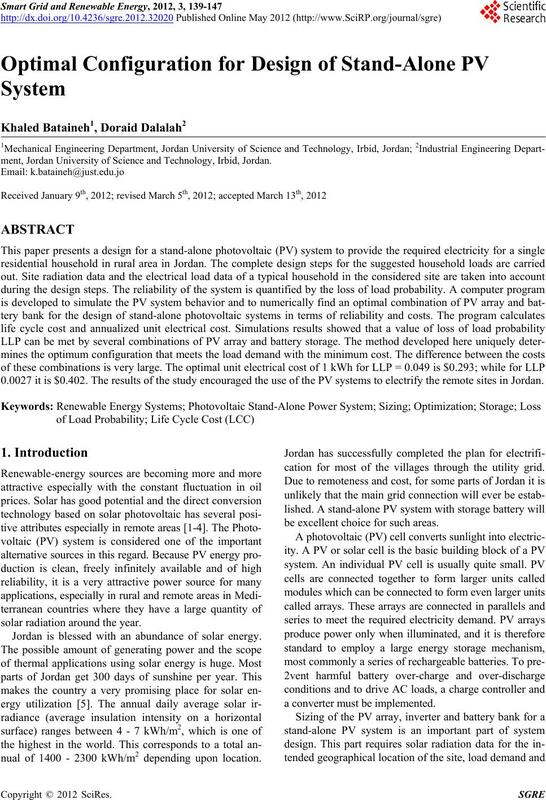 Th e results of the study encouraged the use of the PV systems to electrify the remote sites in Jordan. solar radiation around the year. Jordan is blessed with an abundance of solar energy. nual of 1400 - 2300 kWh/m2 depending upon location. cation for most of the villages through the utility grid. be excellent choice for such areas. a converter m ust be implemented. demand during the total operation time of the installation. ity that the system will be unable to meet energy demand. role in determining the effectiveness of the RE systems. ampere-hours collectable in the battery. which is located in t he northern part of Jordan. sists mainly of solar panels, inverter, batteries and load. the requirements of the common household AC appliances. charging and discharging of the battery bank. Figure 1. Schematic of stand-alone PV system. Table 1. Clear days and sunshine hours average numbers. 30˚ degree f a cing south. Table 2. The Household Load Data. Figure 3. The load profile of the household. zontal surface should be converted to that on PV modules. Hay’s sky diffusion anisotropic mode l .
irradiation is shown in Figure 2.
maximum permissible depth of discharge of the battery. 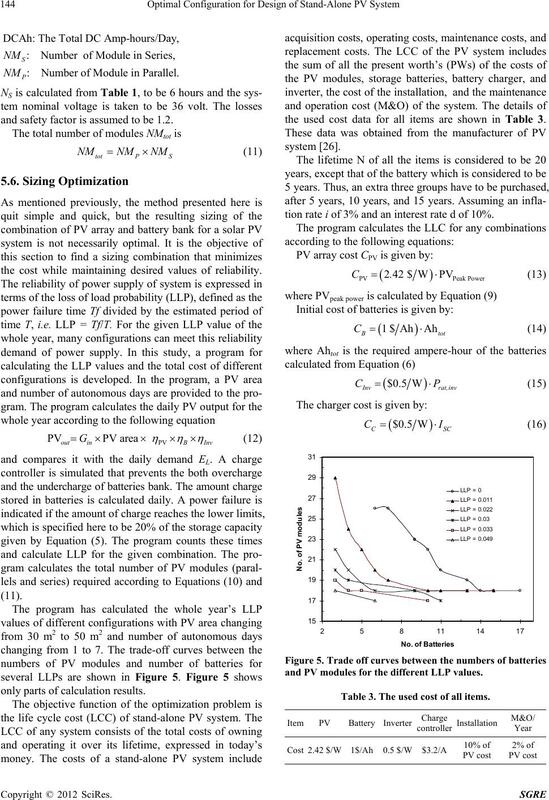 -PV Efficiency ηPV = 14%. shows that the lowest irradiation corresponds to Dec.
for five autonomous days is 61.975 kWh. Figure 4. Daily amount of charge remaining in the batteries. production completely charge the batteries during Oct.
tem over two months to completely rech arge the batteries. beginning of January. After that is increased rapidly. charge by the array and from over discharge by the loads. and to maintain the DC bus voltage to about 36 V.
1800 W, 36 VDC, and 50 Hz. : Number of Module in Parallel. and safety factor is assumed to be 1.2.
the cost while maintaining desired values of reliability. only parts of cal c ul at ion results. the used cost data for all items are shown in Table 3.
tion rate i of 3% and an interest rate d of 10%. 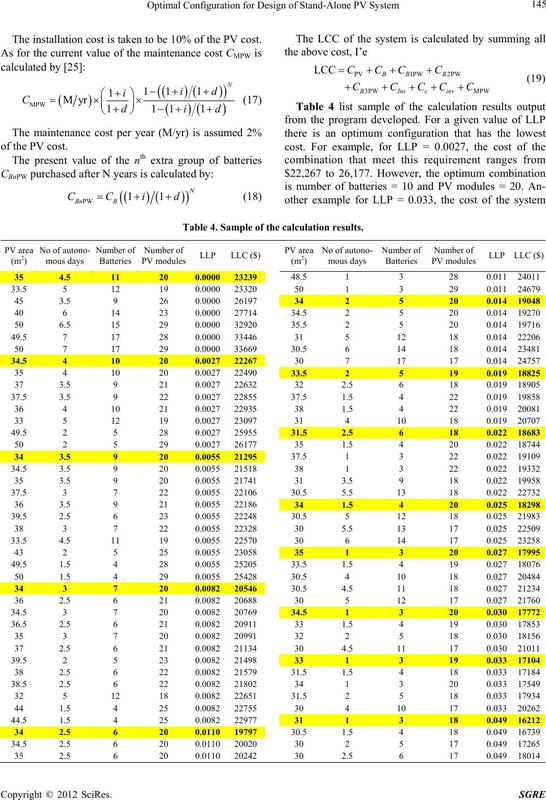 and PV modules for the different LLP values. Table 3. The used cost of all items. The installation cost is taken to be 10% of the PV co st.
Table 4. Sample of the calculation results. other auxiliary hybrid system or not. 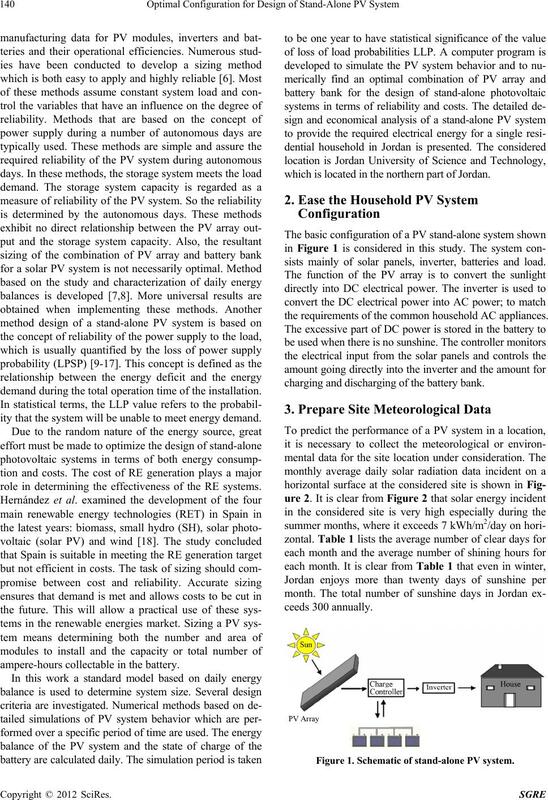 the life cycle cost analysis of the PV system is presented. tems are decreased and their efficiencies are increased. tions Energy Conversion, Vol. 24, No. 2, 2009, pp. 442-451.
plied Energy, Vol. 73, No. 2, 2002, pp. 183-193. Reliability,” Desalination, Vol. 209, No. 1-3, 2007, pp. No. 1-3, 2001, pp. 369-378.
mate JMD,” Amman, Jordan, 1998. S. Silvestre, “Review of System Design and Sizing Tools. 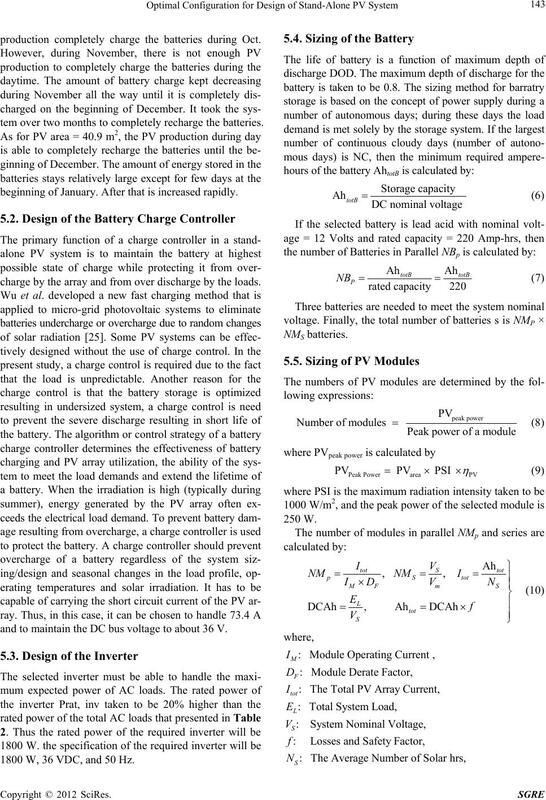 Applications,” Elsevier, Oxford, 2003, 543 p.
Solar Energy, Vol. 32, No. 2, 1984, pp. 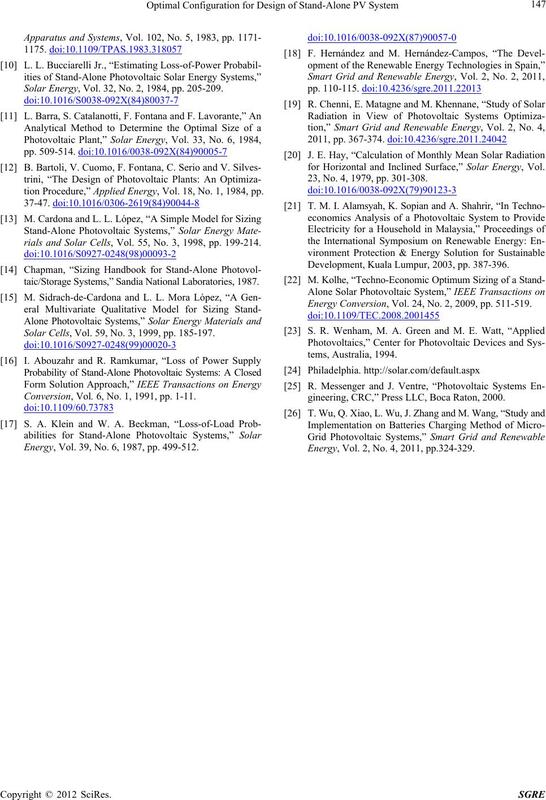 205-209.
tion Procedure,” Applied Energy, Vol. 18, No. 1, 1984, pp. 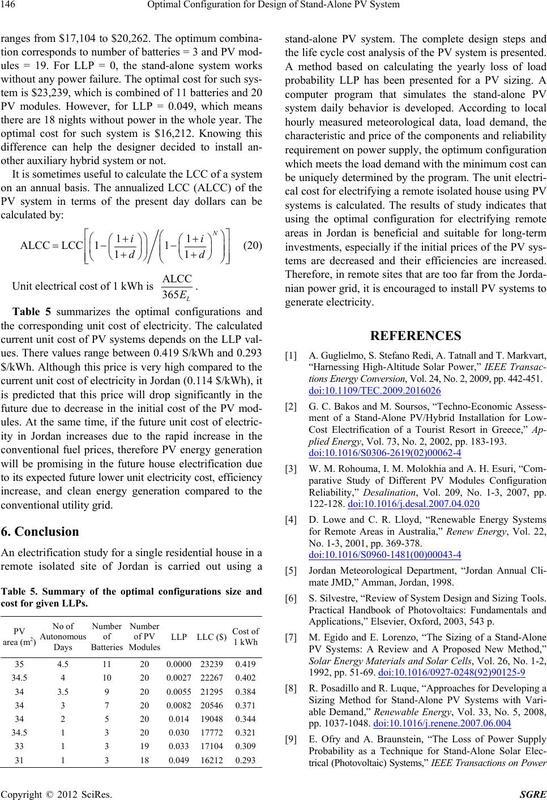 rials and Solar Cells, Vol. 55, No. 3, 1998, pp. 199-214.
taic/Storage Systems,” Sandia National Laboratories, 1987. 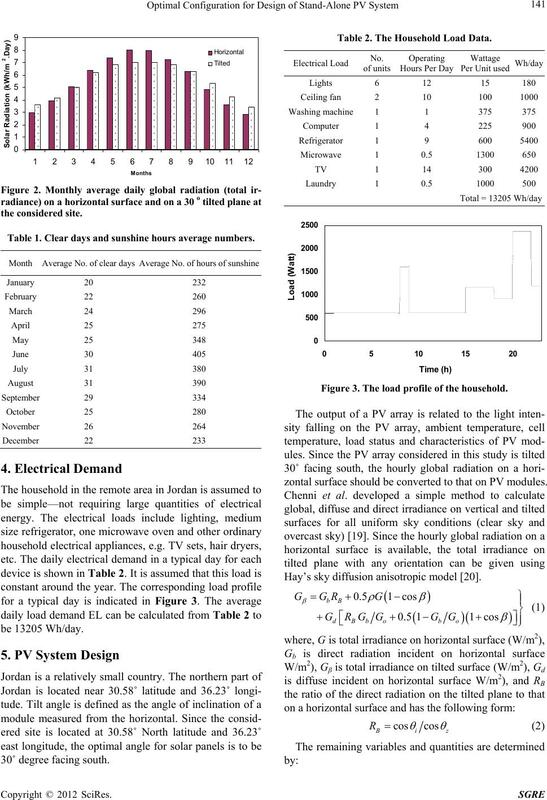 Solar Cells, Vol. 59, No. 3, 1999, pp. 185-197. Conversion, Vol. 6, No. 1, 1991, pp. 1-11. Energy, Vol. 39, No. 6, 1987, pp. 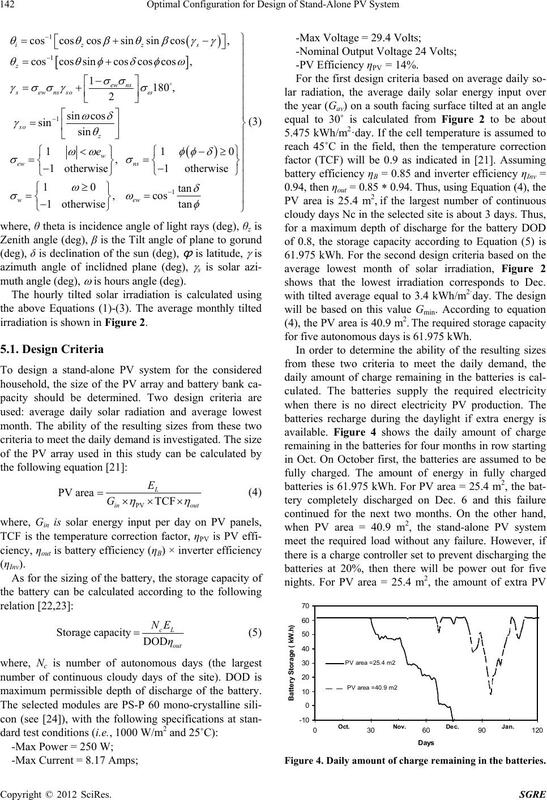 499-512.
for Horizontal and Inclined Surface,” Solar Energy, Vol. 23, No. 4, 1979, pp. 301-308. Development, Kuala Lumpur, 2003, pp. 387-396. Energy Conversion, Vol. 24, No. 2, 2009, pp. 511-519.
gineering, CRC,” Press LLC, Boca Raton, 2000. Energy, Vol. 2, No. 4, 2011, pp.324-329.